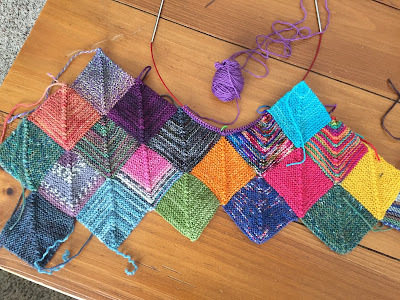 Part of the throw - it changes on a daily basis as I add on a square or two. While I've been completely captivated with knitting on my mitered square throw lately, I do have a couple of finished projects to show you, and though I'd share a bit of the thought process that goes into how I make something. First up is a hat I made for my dad's birthday. 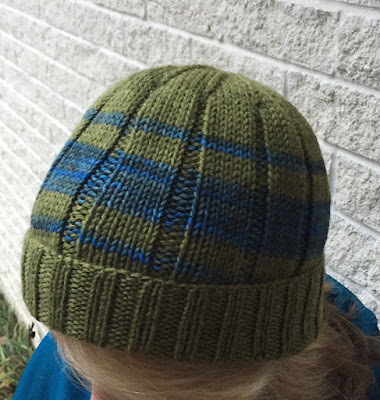 I wanted to make one that was a little lighter weight than the other hats that I've made for him - this way, if it's not super cold, he can still wear a hat when he's outdoors and not get too hot. Of course, I didn't count on this year being the winter that never ends for Oregon, so it may not be warm enough quite yet, but when I started this, I thought surely their snowfall would be trailing off...apparently not. Yarn is Cascade 220 Superwash in Turtle colorway, with Madelinetosh DK in Worn Denim colorway for the stripes. 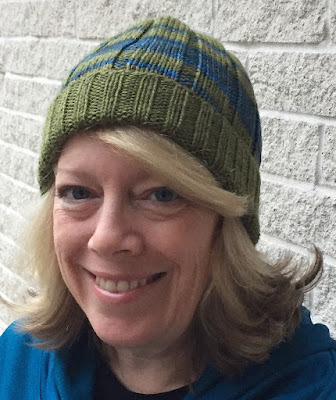 I used a size 8 needle for the body of the hat (size 6 for the brim), which made it have a looser, softer drape. I really love how the variations in the blue stripes look so good with the green of the main color. Yarn is from Blueberry Pie Studio, colorway is My Box of Crayons. I didn't even block these, just put them on the sock blockers for a picture. Once I finally block them, the stitching will smooth out a bit. THIS is where they ended up - on my feet! I love my new house socks so much! 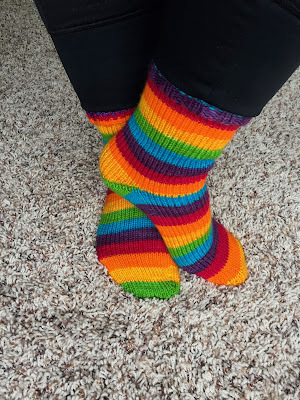 Bright colors, happy stripes, warm feet...exactly what I wanted. Two projects out, cart with more projects pulled close. Actually, this was a fairly neat day if I'm being honest. Two water cups because knitting is dehydrating. Or else I'm lazy and don't want to have to get up to refill as often. 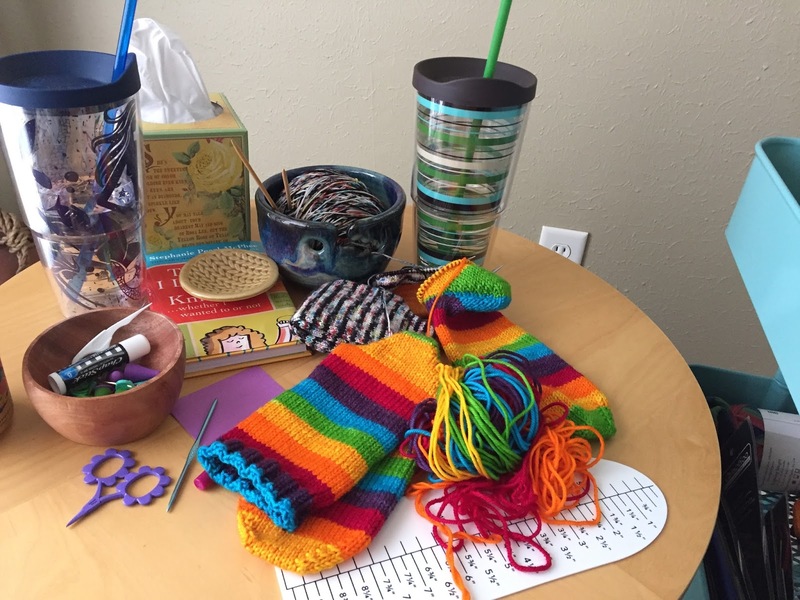 Yarn on a table is a mess, but yarn in a tray is art...? As always, I'm enjoying what I'm knitting - life is too short to knit what you don't want to. One of these days I'm going to have to break into more of my sock stash yarn and knit up some more socks in order to get different leftovers for my throw. 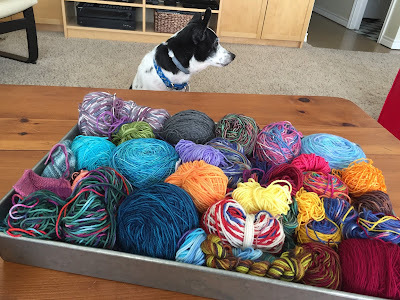 But that day is not today - right now I'm still playing with mixing and matching the yarn in my tray for the throw. Back to my squares I go! 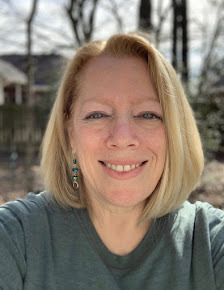 Your sock pictures are killing this sock obsessed woman here! I love them all. Hahaha second sock syndrome! My personality would not allow me to not finish the pair. Love your fun house socks and the hat you made for your dad. You've gotten so talented with this knitting thing! Thank you! I like all the yarn so much it's hard to not start another project. But eventually I end up wanting to wear the new socks, so I finish the second one. Winter coat, gloves, and a handknitted cowl! 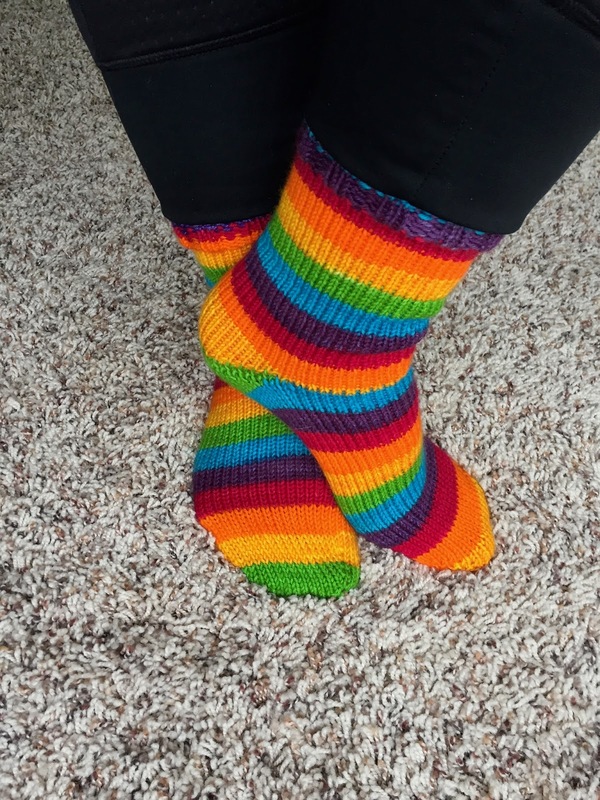 LOVE your bright just-for-you house socks! 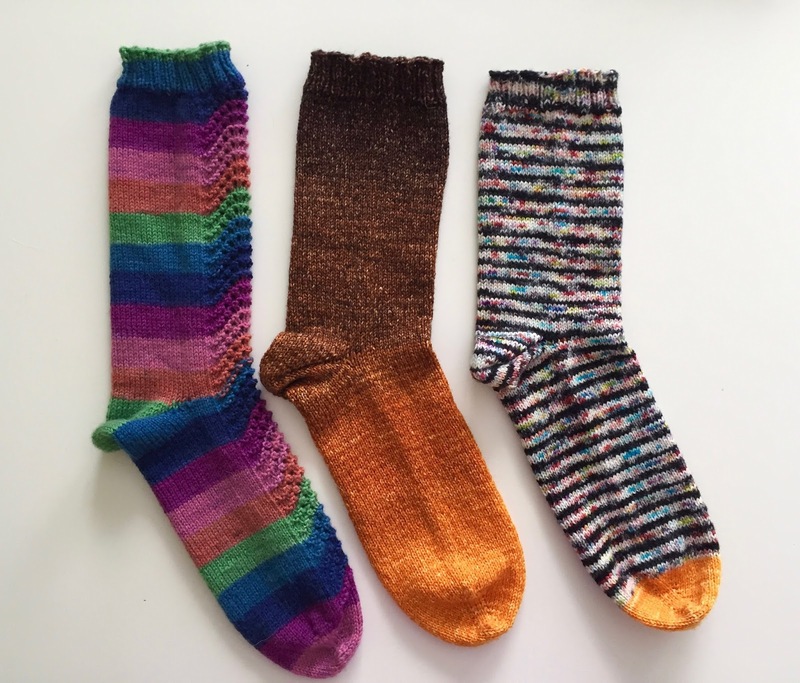 The sock with the black and multi-stripes--love. 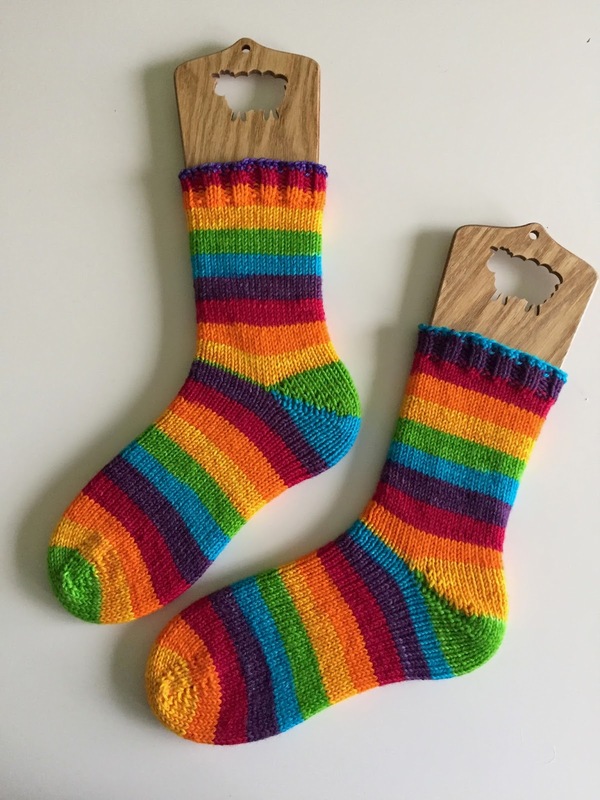 Is that a single sock yarn, or are you doing the striping? Your mitered blanket is so pretty, and you DO have a very nice collection of yarn for it! The black and multi socks are so pretty, aren't they? One skein except for the toes - that yarn came from the brown/golden sock next to it. The rest of the yarn is from In The Deep Hue Sea, the colorway is When Worlds Collide. They are from So Cal and may be at stitches west? 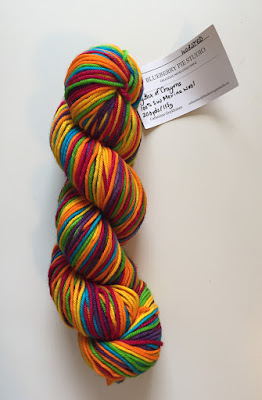 My mom got me this skein last year at the CGFF. That throw will be gorgeous! The other day my mom bought her lab this colorful knitted teddy bear from the thrift store ( she buys stuffed toys there for her dog because her dog will chew it up in one day and it's a waste to spend $ at the pet store for something that won't last a day). Anyway, she got this bear and my mom was saying how beautiful it was and said it's a shame that it ended up at the thrift store because you could tell that some one spent a lot of time knitting it. Surprisingly, the bear has lasted a week already. I think the dog really likes it! I love, love, love how that throw is coming out! OK so your hats and other knitwear are so adorable you almost make we want to move to a colder climate so I could wear something like that! You are right that life is too short to not do what you want. I don't knit but have the same in other things. Like a book. I used to finish it even though I didn't like it. If I don't like a book halfway, I quit and start a new one. Same with Netflix. If I start a serie and I don't like it, I stop watching it and choose something new. Oh and as always: your projects are lovely and so full of colour. Your yarn mess could be modern art for the house! It looks pretty! I love the hat and the house socks! And the single socks too :) It's so fun to see how the self striping stuff turns out!